The following are links about Ionic Ave Boys Club you may find interesting. Also check out the other pages. The following are comments left about Ionic Ave Boys Club from site visitors such as yourself. They are not spell checked or reviewed for accuracy. I remember so well going swimming there in the Boys Club. My cousin Matt would go with my Brother and I. Matt would hollar out KEY....KEY !!!! He had no problem singing out like that. I was a bit more bashful !! Very good time at the Club !!!!! I went with the Ionics Ave Boys Club in 1960 to Fenway Park. Mew saw Ted Williams hit his 506th Homerun. Memorable. I remember in the late 1950's my Mom droping me and my friend Dave off every Saturday with our Boy's Club card in hand at the Ionic Ave club ,the best years of my life . 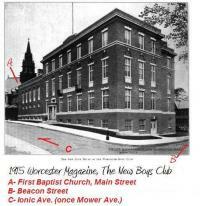 I remember going to the Boys Club in 1928 -1938 every day after school. I was always disappointed when it closed on Sundays. I have fond memories of the staff to include Charlie Bunker who ran the Athletic dept and Art Crowley the swimming coach! Good ol days! I went almost all of the 1960's I remember having to swim naked with the locker key on my ankle. I remember going to the boys club.I went there in 1958.Would have a line to get to the gym.I remember Art Crowley also .Those were the good old days.Yes remember having to swim naked also.Also same situation at the ymca. How about Sterling Junction boys club camp, $25 for a great two weeks of summer fun. Bug Juice! !